This Arts and Crafts styled sprawling ranch house plan has so much to offer the modern homeowner. A three car garage with extra storage adds space for a third automobile, workshop, or golf cart. Inside, each bedroom of this house plan features elegant ceiling treatments, a walk-in closet and an adjacent full bathroom. A large utility room with a sink is conveniently placed down the hall from the secondary bedrooms. The large, gourmet kitchen of this house plan includes a walk-in pantry and a large central island. The spacious dining room offers large windows and a buffet nook for furniture. Custom-style details abound in this luxurious plan with built-ins in the great room and breakfast areas. This house plan's well-appointed master suite includes a secluded sitting room that enjoys rear views, porch access and dual walk-in closets. The master bathroom is a spa-like retreat with dual vanities, a large walk-in shower, built-ins and a vaulted ceiling. The screened porch offers the best in year round outdoor living with a fireplace. A bonus space over the garage has nearly 800 square feet of space for future expansion, a large hobby space, home theatre or exercise room. 1st Floor: 3048 Sq. Ft. 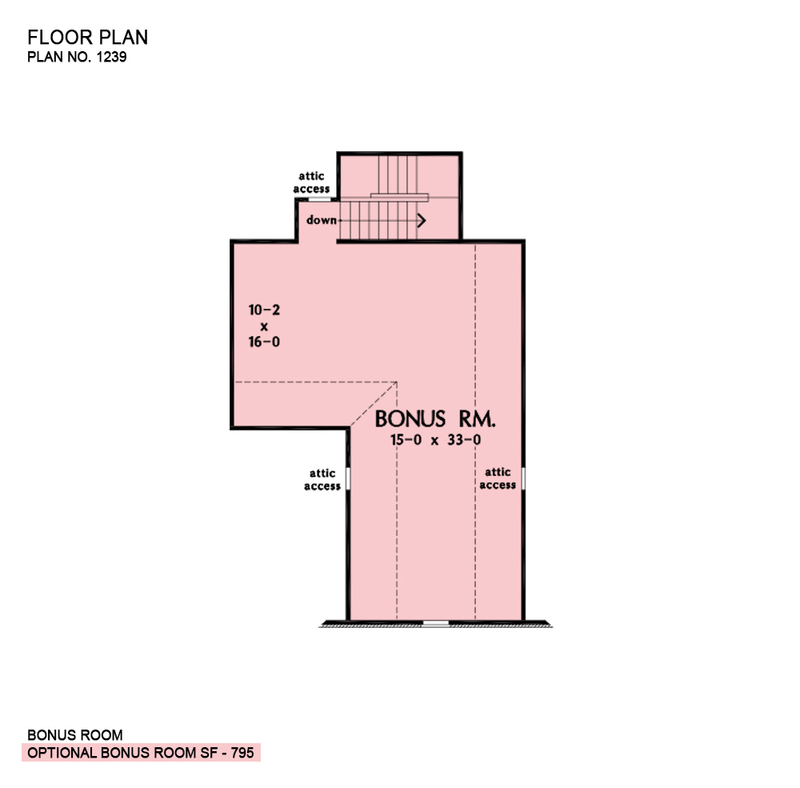 Bonus Room: 795 Sq. Ft.
House Dimensions: 88' 6" x 75' 8"
Bedroom #3 (Tray): 12' 0" x 14' 0" x 10' 6"
Bedroom #4 (Tray): 12' 0" x 14' 0" x 10' 6"
Bedroom / Study (Coffered): 12' 0" x 13' 10" x 13' 0"
Bonus Room (Clipped): 15' 0" x 33' 0" x 9' 0"
Breakfast Room (Flat): 15' 0" x 10' 4" x 9' 0"
Deck / Patio (None): 31' 0" x 16' 8" x 0' 0"
Dining Room (Tray): 14' 0" x 11' 10" x 14' 0"
E-Space (Flat): 5' 4" x 6' 4" x 9' 0"
Foyer (Tray): 7' 8" x 8' 2" x 12' 10"
Garage (Flat): 24' 0" x 33' 0" x 0' 0"
Garage Storage (Flat): 11' 4" x 2' 0" x 0' 0"
Garage Storage Bay (Flat): 3' 4" x 12' 0" x 0' 0"
Great Room (Tray): 20' 0" x 20' 6" x 15' 0"
Kitchen (Flat): 14' 0" x 13' 4" x 9' 0"
Master Bedroom (Tray): 15' 0" x 17' 0" x 11' 0"
Mud Room (Flat): 5' 8" x 3' 4" x 8' 0"
Porch - Rear (Flat): 29' 4" x 10' 4" x 12' 0"
Porch - Front (Flat): 28' 6" x 6' 0" x 12' 0"
Porch - Screen (Flat): 15' 8" x 16' 8" x 9' 0"
Utility Room (Flat): 9' 8" x 11' 0" x 9' 0"